This has been a "re-thinking" summer for me. One of the things I've thought about a lot is the role of popular culture in the classroom. First, I've thought about popular culture in connection to G, the little guy I've been tutoring three days a week. G is a third grader reading at a beginning first grade level. He is also an ELL, who speaks primarily Spanish at home. G struggles to remember basic sight words like with and want, but he loves the Transformers, and doesn't have any trouble with Decepticon or Optimus Prime. He also loves lowriders (it's a kind of car, for the uninformed) and can read engine, hydraulics, chrome, and velvet and suspension with absolutely no problem. All education, particularly literacy education, is a trade. There are skills and texts that, as teachers, we endorse and are committed to teaching. But these must connect, in some way with the attitudes and tastes students bring into class. Schools do not reproduce popular culture- but it is self-defeating if they ignore or dismiss it. The surest way to alienate any group is to indicate that their allegiances and interests are not respected (p. 109). Ouch! So much for my high and mighty beliefs about children's literature! I've also thought a lot about one of the readers (or nonreaders) living at my own house. Son #2 is an incredibly bright kid. When it comes to technology, he's the man. He has a terrific sense of humor and is very clever with words. He's a budding entrepreneur, who swears he will be a millionaire before he's 25, and I suspect he is right. Much to my chagrin, though, he does not like to read, not at all, not one little bit. He CAN read. He reads the newspaper each morning, or at least part of it. He reads magazines and tennis shoe catalogues. He reads the obligatory thirty minutes I require each night, but he would never, of his own accord, choose to read a book. Son #2's passion is video games, and if he had his way, he would spend all of his waking, and non-sporting hours, with a controller in his hands. Son #2 is a lot like many of the kids I teach. I can surround them with wonderful books, read aloud and talk books until I'm blue in the face, even MAKE them sit quietly with a book for 30 or 45 minutes, but I can't MAKE them love books. With all this in mind, I've found a new series for these kids. The first two books in HERO.COM/VILLAIN.NET just came out this Spring. The books in the HERO.COM series are about heroes, and VILLAIN.NET are about bad guys. I just finished HERO.COM: RISE OF THE HEROES, and I think it's definitely a book that will interest some of my video game loving kids. In the opening chapters, four middle-schoolish aged kids- siblings Lorna and Toby, and their friends Pete and Emily, are on the computer in the middle of a terrible lightning storm. The computer is hit by lightning, and when it reboots, these very ordinary kids are on a website, HERO.COM that they have never seen. A disclaimer at the bottom of the website says the site "is not responsible for any damage, destruction, or loss or property…The site does not condone the use of powers for monetary gain, selfish or evil pursuit…" The children try out the website and discover they have superpowers- things like flying, xray vision, invisibility, reading people's minds, etc. Of course, along with these powers, come encounters with bad guys, and the four unlikely heroes find themselves embroiled in a battle with the evil Dr. Tempest. This battle takes them to the farthest ends of the world. This is not a book I would describe as outstanding children's literature. It's mostly plot, plot, plot, with only a few hints of real character development. Even so, it's a series that I can't wait to put out this August, because I think some of my reluctant fifth grade/middle schoolish readers are really going to love it. And if it helps some of those kids cross the bridge from their world into mine, I'm all for it. HERO.COM/VILLAIN.NET also has a fun website. Kids can take a quiz to decide whether they are heroes or villains, create superheroes/villains, and view book trailers. I think my video game kids will love this site. OK, I'll admit it. When it comes to dogs, I'm a total pushover. Rescue dogs- even more so. And books about rescue dogs- you got me! Tonight (at the library! 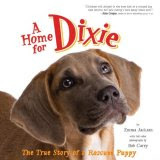 ), I stumbled across A HOME FOR DIXIE. It's not like this book is anything really new- there are three cute puppies that don't have a mom or dad. They end up in a rescue shelter, where one of the puppies is eventually adopted by Emma Jackson, the author of the book. The illustrations in this book are beautiful photographs of Emma and Dixie (my favorite is of Emma, in her sleeping bag on the kitchen floor, laying next to Dixie, who does not want to sleep in the dark, scary kitchen, all by herself on her first night away from her sisters). The really fun thing about this book is that Emma Jackson, the author, is a middle/high school girl. Can anyone say, "Mentor text?" Poetry Friday is at Year of Reading. I found a really fun new nonfiction book at the library (did you notice I did not say bookstore?!) this week. THE PROBOSCIS MONKEY has everything I look for in a nonfiction series- strong content, photos that make even the most reluctant reader think books might be ok, and text features like a table of content, maps, a glossary, and index. And best of all, it's a relatively easy read- about as hard as FROG AND TOAD or HENRY AND MUDGE. The book would also be a great mentor text for kids writing nonfiction reports. I'm hoping this is a series, and there are, or will be, a bunch more, of these. At first glance, Carin Berger's OK GO appears to be a relatively simple text. The first half of the book, or maybe even a little more, consists of tiny cars, done in collage, rushing all over the page. On each page, the word GO is written anywhere from 1-15 times, and embedded within the collage. Several pages only have the word GO written over and over again. Then, about two thirds of the way through the book, the word STOP appears in enormous letters, and all the cars come to a screeching halt. The last page, a fold out double-wide, contains a surprise (or at least it was a surprise to me!) Again, the page is a collage of a whole bunch of different figures, but this time, each figure is doing something to save the earth. Written next to each little picture, is a little rhyming saying, e.g. Save the planet, Janet . . . "
Looking back through the book, one realizes that the Save the Earth theme has run throughout the book. The collages are all made of recycled materials, e.g. ticket stubs and magazine ads. In the beginning collages, the background/sky is green, and gradually it gets brown/grayer and grayer, like it is becoming polluted. And then there is that fabulous end collage. This is a fun book for a lot of reasons. Of course, it would be perfect for Earth Day, or a unit on recycling or pollution. I could use it in a lesson on inferring or foreshadowing, or paying close attention to the author's clues (I wasn't, and totally missed the message until the last page!) The illustrations would make it a perfect candidate for a unit on collage. And I could see emergent readers gravitating to the book's easily readable text. A great book for any elementary library! When Ashley Rhodes was about three years old, the Florida Department of Human Services determined her mother unfit, and took custody of Ashley and her younger brother. The two children spent the next ten years bouncing from foster home to foster home. Some of the situations were passable, several, however, were absolutely horrific. In one particularly unbearable situation, Ashley lived in a trailer, approved for two children, with eleven other foster children. The children were made to drink hot sauce or crawl around the dirt backyard on their knees for punishment. When Ashley was about twelve, she was adopted by Gay and Phil Courter. Gay and Phil had already raised two biological sons. When they survived the crash of a private plane, they decided they had been left on Earth to do something special. They adopted Ashley and took on all of the complications of life with a child who had never experience a normal, loving home (not to mention all of the regular teenage issues). I adopted my sons out of the foster care system when they were seven and nine. Although I had known my boys for several years, nothing prepared me for the length of the adjustment period, or for the depth of the heartache they had gone through. I wish this book had been available to me, then, because I think it would have made our journey a lot easier. This memoir is a must read for anyone involved with children in the foster care system. "Broken promises crippled me for many years. As the Courters kept their promises to me, my faith in others were expanded. Day after day, they were there for me; until one day, I not only felt safe, I did not want to leave. Maybe that is one definition of love" (p. 289). I have not given up blogging. My hard drive crashed. Hopefully I will be back on line soon.